With Kora and Griot, Crown immerses us in African Royalty from the first notes. 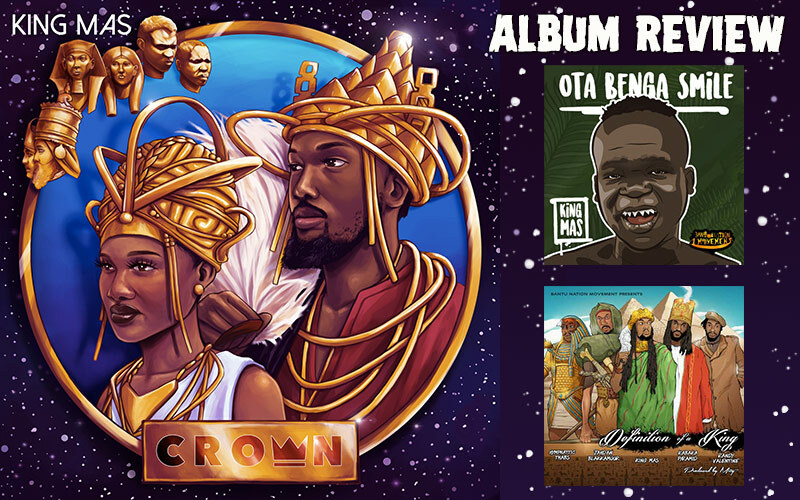 The third studio album of Boston-born artist King Mas is the first full-length release by his label Bantu Nation Movement, a collective he describes as consisting of "creative individuals and spiritual beings who represent the "Bantu" diaspora of the African continent and all of the various manifestations of our culture around the globe". In charge for most of the song-writing and production himself, King Mas has assembled an opalescent array of musical talent on the release, inluding his brother, producer and vocalist MityMaose, and skilled instrumetalists such as Llamar "Riff Raff" Brown, Nko Fallou Fall, David Adeyemi, Dernst "D'mile" Emile II and Dean Fraser. As mentioned above, the first song introduces Jali Fily Cissokho, a professional Kora player and Griot from Senegal. Griots are musicians by heritage who once played for the kings of Mali, handing down oral history of the Mande people for over 4,000 years, "a future long ago", as singer King Mas adds. The following lyrical downpoor in Round & Round can't really be summarized here but must be listened to - what a powerful entrance! In subsequent songs, much softer and love-soaked tones are struck, such as Queen (featuring Pupa Freddy's daughter Zosia McGregor), the title track Crown, Di Sumn ft. D Major, Body Language, Da Da Da or Pretty Eyes. Crush and especially No Lie pick up the tempo a bit, the latter sporting another Reggae/ Dancehall Royalty's offspring: Yelloman's eldest daughter K'reema pon di mic! Thus, most of the 17 tracks deal with relationships and vibe in a laid-back, R&B-tinged sound, as befits an album released on Valentine's Day. It's only in the second half that less romantic subjects are picked up once more, and, in my humble opinion, it's here that King Mas reveals his true strength of wording, message and flow. Flat Earth, for instance, stresses the importance of education and ancient knowledge about herbs for the well-being of mankind, while Sorcery talks about the benefits of African Spirituality, citing videographer and author Dalian Adofo who preserves knowledge of original African History through his documentary series Ancestral Voices. In Ota Benga Smile, King Mas takes the painful position of the Mbuti man Ota Benga who, in 1904, was bought from Congolese slave traders by an American anthropologist and brought to the US to be featured in a human exhibition and, worse, in the Bronx Zoo. Make sure you educate yourselves on this story! Name-giver of the riddim by producer Green Lion, Militant Step highlights King Mas' vocal prowess and versatility, ranging from a melodical, high-pitched singjay style to a fast-paced, guttural rap. The most outstanding track, however, is Definition Of A King. Not only the amazing MityMaose production based on Jackie Mittoo's Drum Song make the tune a true gem, but especially the sheer cumulation of strong artists and vocalists: besides King Mas himself, Randy Valentine, Kabaka Pyramid, Jahdan Blakkamoore and Hymphatic Thabs contribute their visions of what it means to be a King in the 21st Century. And to ensure you don't miss a word, check the lyric video below! Closing the album with two exquisite live dub mixes by Wadadah II, Crown leaves us with plenty of food for thought. King Mas aka The Musical Obeah Man has managed to oppose the shallows of Pop with serious input that invites listeners to acknowledge and wear their crown proudly.